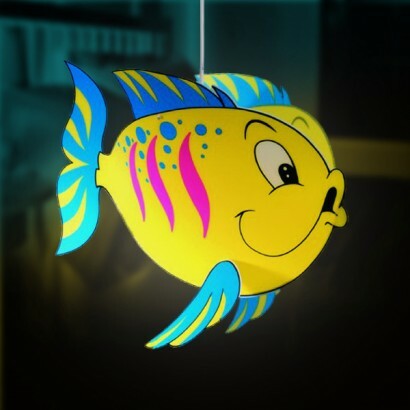 A colourful tropical fish pendant light shade that's perfect for suspending from ceilings in either girls or boys bedrooms or playrooms, this fun fish lampshade has a gender neutral but vibrant colouring of aqua, yellow and hot pink, with animated detailing on its face and body. For use with a maximum 100w E27 bulb (not included) and measures 35x45x25cm. I bought this light shade for my 2 year olds room he absolutely loves it. Orded it and was here the next day absolutely thrilled with the service too.